Since the city’s inception, L.A. residents have known one thing for sure: You can’t beat our sunshine. Many of our foremothers and forefathers embraced the brilliant outdoor lifestyle SoCal offered, and have left us with gardens, historic structures with sprawling grounds, and beaches that can’t be beat. Below are ten ideal historic places where you can lounge away—and learn a little something—on a sunny summer day. Take a trip to the gothic English countryside without ever leaving Beverly Hills. Greystone was the fiefdom of charming society mainstay Ned Doheny, the only child of oil baron Edward Doheny. In 1928, Ned and his wife, Lucy, moved into Greystone with their young family. Less than a year later, Ned was dead in Greystone’s guest room, the victim of a murder-suicide supposedly carried out by his best friend and secretary Hugh Plunkett. Today, Greystone is a public park featuring lush, European-style terraced gardens. View the fountains, hide in one of the many outdoor nooks, and take a stroll down Cyprus Lane. And while you’re at it, keep an eye out for the ghost of Greystone’s very own Heathcliff, Hugh Plunkett. 905 Loma Vista Drive, Beverly Hills. 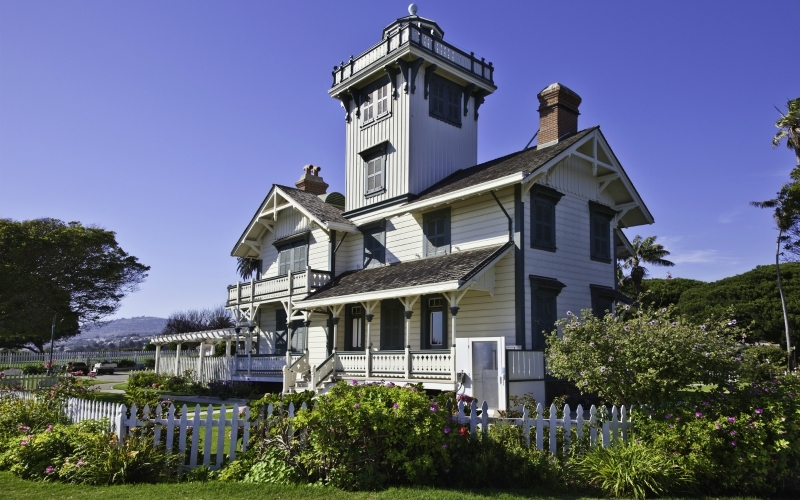 Built in 1874, the lovely Point Fermin Lighthouse was built to guide ships coming into the Los Angeles Harbor. The first lighthouse keepers were two sisters, Mary and Ella Smith, who lived and worked at the isolated lighthouse for eight years. Today, the lovingly restored lighthouse is surrounded by a bustling waterfront park with ample picnicking grounds. During the summer, the park holds numerous outdoor events including concerts and Shakespeare by the Sea. 807 W. Paseo Del Mar, San Pedro. Once the rancho of 19th century Los Angeles legend Elias Jackson “Lucky” Baldwin, the county arboretum is an often-overlooked outdoor paradise. The arboretum features a rose garden, tropical greenhouse, herb garden, a large lake, aquatic garden, and exotic plant collections from far-off places like Australia, Africa, and Madagascar. Don’t miss Baldwin’s private love shack, a toy-like Queen Anne cottage where he would take his lady friends for romantic weekends, and the Santa Anita Depot, an 1890 train station that was moved to the arboretum in 1970. 301 N. Baldwin Avenue, Arcadia. Soak up some sun and a lot of culture at this beautiful state beach in the heart of Malibu. Featuring a stunning beach, picturesque lagoon, and the Adamson House (Malibu’s first beach house), the park was once the private domain of Rhoda Rindge Adamson, the only daughter of Malibu’s first family. In 1923, Adamson and her husband, Merritt, began construction of their quirky Moorish-Revival “beach cottage,” decorated with rare tiles from her mother May’s Malibu Potteries. Today, you can tour the house, walk the beautifully landscaped grounds, and marvel at the beachside pool (tragically, Merritt committed suicide in the adjacent pool house in 1949). After your tour, strip to your bathing suit and spend the rest of the day swimming, sand-castling, and sunning. 23200 Pacific Coast Hwy., Malibu. In 1919, the eccentric, socially progressive heiress Aline Barnsdall bought 36 hilltop acres in Los Feliz. She hired legendary architect Frank Lloyd Wright to design what she hoped would be an experimental art commune. Although Barnsdall’s dreams of a creative utopia never came to fruition, today this public park is home to one of the best spots for sunbathing in Los Angeles. The lawn surrounding Barnsdall’s home, Hollyhock House, is perfect for a summertime sun nap, and one of the best places to watch that same sun set over the City of Angels. 4800 Hollywood Blvd., Los Feliz. This sprawling public park was once Miradero, the estate of Leslie C. Brand, the sporty and scandalous founder of modern Glendale. The extensive grounds include the fantastical “East Indian” Brand Mansion, now a public library; plenty of lawns for lounging, grilling, and playing soccer; fantastic views of Glendale; and a beautiful Japanese Garden. As the sun sets, make your way up the hiking trail behind the mansion to the bizarre Brand Family Cemetery, nestled in the mountains of Glendale. You’ll find Leslie C. Brand’s final resting place, topped by a Pyramid he built in honor of himself. 1601 W. Mountain St., Glendale. Good vibes abound at this beachfront park off the Pacific Coast Highway. It’s not surprising since it was once the playground of the effervescent Marion Davies, movie star and true love of William Randolph Hearst. In the 1920s and ‘30s, Davies’s blithe spirit oversaw countless beach parties, costume balls, and picnics on the property, which featured a massive Georgian Revival mansion, guest homes, and a pool designed by famed architect Julia Morgan. Although the mansion is gone, a guesthouse and the pool remain. Thanks to patron Wallis Annenberg, visitors can once again swim in the beautiful pool, kids can play in newly installed waterworks or on the beachfront playground, and chilled-out adults can eat and chat at numerous picnic tables. No doubt, Marion would be pleased. 415 Pacific Coast Hwy., Santa Monica. The dedication of Chinatown’s Central Plaza in 1938 signaled a new beginning for the Chinese-American community in Los Angeles. Pushed out of the original Chinatown due to the construction of Union Station, this sunny square was to become the vibrant hub of the new Chinatown. Today, it is a wonderful place to lounge on a summer afternoon—eat some delicious food, join elderly locals in a board game, and watch Angelenos of every stripe take selfies in front of the statue of movie star Bruce Lee. 950 N. Broadway, Chinatown. Like something out of a Southwestern fairytale, this leafy, secluded public park was the realized dream of the editor, writer, and tireless California booster Charles Lummis. Starting in 1894, Lummis and his friends and family began to hand-build and landscape this remarkable, eccentric property, which soon became the offbeat cultural hub of early Los Angeles. It is still the perfect place to sketch, read, or just marvel at all the natural California beauty that Lummis extolled in his influential pro-California journal, The Land of Sunshine. 200 E. Avenue 43, Highland Park. ED NOTE: This List previously featured the Paramount Ranch, which burned down in 2018. Next article3 Distinct Ways to Celebrate the Royal Wedding Day in L.A.